Let’s look at some of the best bathroom plant choices! The aloe plant just keeps on giving! Not only is it known as the ‘plant of immortality’ because it is so difficult to kill, it is an incredibly useful plant to have around the home. Aloe vera juice is bursting with vitamins and minerals, while the gel can be used as a topical treatment for minor cuts and burns, insect bites, dry skin and more. This striking and healing plant should be placed close to the bathroom window and, because of its low water requirements, the humidity alone may meet most of its water needs! Lucky bamboo needs very little light to grow, and should be placed in low, indirect light. It doesn’t even need any soil – simply pop the stalk into a container filled with pebbles and water. Change the water every two to four weeks. Be warned that this is a fast growing plant, but you can curtail its growth by providing a physical barrier (such as a recessed shelf) or by shaping it regularly. These pretty blooms do well indoors. In fact, in many climates, they must be overwintered inside – with the bathroom being one of the best locations to do just this. Begonias do best in fluorescent lighting, although they can survive when placed in window locations too (the exception being north-facing windows). They also require daily bathroom humidity or regular misting. A popular variety of fern with frilly leaves and long, hanging fronds, the Boston fern is native to sub-tropical and tropical rain forests. It grows best when placed on a windowsill or in a position which receives lots of indirect light. Humidity and temperatures of between 55 and 75 degrees are also important for your fern to thrive. In the growing months, the soil should be kept moist, but not saturated. 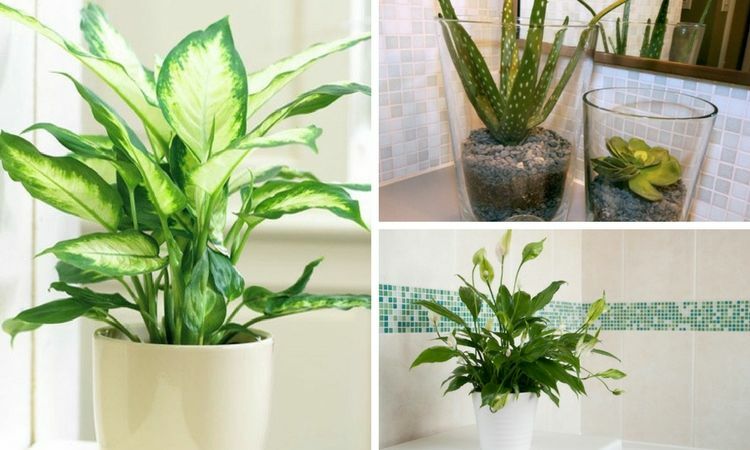 If you have a larger bathroom space to work with, the dieffenbachia is a great choice. With broad, striking leaves that can grow to a foot long, the entire plant can grow to six feet high. Taking care of the dieffenbachia requires little effort – it thrives year round in temperatures above 60 degrees F, and in humid conditions with moist soil. However, a bright room or fluorescent lighting is a must for this plant, which also prefers to be kept out of direct sunlight. Ivy, particularly English Ivy, is one of NASA’s top air purifying plants. It can even help you keep the bathroom clean and hygienic by removing feces and mold from the surrounding air! In bathrooms where space is at a premium, the ivy plant can be placed on a ledge or in a hanging basket where the leaves can elegantly trail down. Give your bathroom a luxury spa feel with the addition of a subtle yet elegant orchid plant. Place your orchid on the bathroom windowsill, where the indirect sunlight will provide adequate light but won’t cause leaf scorch; while the high humidity mirrors the flower’s natural environment. It’s also a relatively compact flower making it perfect for smaller rooms, where it can be perched on the corner of the bathtub or next to the sink. The peace lily is a striking flower, with glossy leaves and white blooms. It thrives in low light conditions, although it should be exposed to some indirect sunlight. To simulate the natural humidity of the tropics, a daily misting or position next to a steamy shower is a must for the peace lily. It’s another of NASA’s best plants for air purity, as it helps to filter out harmful benzene, trichloroethylene, and formaldehyde toxins. Also known as Mother-in-Law’s Tongue, the leaves of the snake plant grow upright, and feature yellow or white edging. One of the hardiest houseplants, the snake plant can survive low light levels and is flexible in terms of heat and water. The snake plant also filters some nasty household toxins from the bathroom air – including formaldehyde which can be found in cleaning products, tile grout, adhesives, and even some cosmetics! Commonly found in public spaces, the spider plant helps remove odors, fumes and around 90% of formaldehyde from the air. This plant can grow in a wide range of conditions and requires little in the way of care. Because of this, they work well in bathrooms where they get either full sun or shade, although if plantlets fail to develop the plant is probably not getting enough light. Allow the top layer of the soil to dry out between waterings.